We're getting a new baby. No, I'm not pregnant again. No, we are not trading in Carter for a newer model. On October 1st, my older sister, Kristi, will be having her second baby. 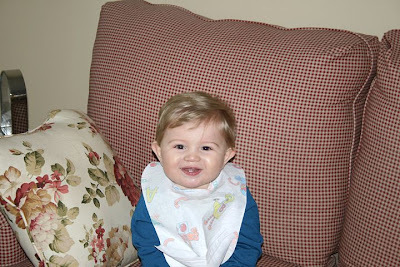 You may have seen me post about my absolutely adorable nephew and Godson, Benjamin before. Well, Big Ben is going to be a big brother to a little baby girl. A GIRL? What do we do with a girl? I'm the second of three girls in the family, but all we've had are baby boys so far. We're not quite sure how to handle this. Needless to say, I am beyond excited. My 2 sisters are my best friends in the entire world. We have to talk to each other every day and see each other at least 2-3 times a week. Ben is like my very own son and he and Carter will grow up more like brothers, than cousins. Therefore, I feel like I am (yes, me) getting a new baby in exactly one week. We can not wait to meet you Grace Morgan.